All the spiced flavour you would expect in a chai, harmoniously married with seriously rich, dark cocoa beans and fresh peppermint leaf. 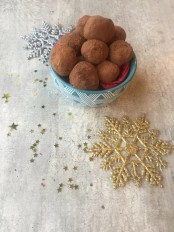 Combine it with steamed milk and you will have the most delicious Christmas treat around! 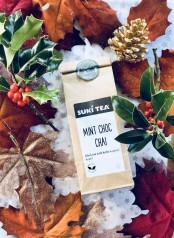 This chocolate and mint infusion is full of flavour and just perfect for this time of the year...think matchsticks and after eights ONLY BETTER!! There is a beautiful chocolate chai flavour initially, with a note of peppermint to follow, with our favourite spicy undertones throughout. A smooth, creamy cup to cosy up with this Christmas. Use freshly drawn boiled water. Infuse one tea measure per pot (one heaped teaspoon per cup) and brew for 3-5 minutes…Some of us like it with milk, others don't - it's your call! Product : Bought this for my friend to try as she is a mint tea addict. It’s scrummy! With ir without a dash of milk. Refreshing and... Service rating : Although an incorrect tea was sent to me, after I had let them know, they sent me poste haste my ordered tea and said I could keep the other tea. Product : Bought this for my friend to try as she is a mint tea addict. It’s scrummy! With ir without a dash of milk. Refreshing and comforting. Product : Gorgeous! the perfect after dinner tea, who needs coffee. Will be recommending to a friend who has been advised to drink mint tea for his digestion, but he hates it. This however may be just what he needs. Product : Gorgeous well balanced flavours. It’s become my favourite chai now!